This article is a cut and paste. I do not apologise for posting this article. It has had regular exposure on many anti-European Government sites. It is fundamental reading for concerned Patriots to help them understand the events that have taken place in Europe since WW2. Start. Mass immigration is a phenomenon, the causes of which are still cleverly concealed by the system, and the multicultural propaganda is trying to falsely portray it as inevitable. With this article we intend to prove once and for all, that this is not a spontaneous phenomenon. What they want to present as an inevitable outcome of modern life, is actually a plan conceived around a table and prepared for decades, to completely destroy the face of the continent. Few people know that one of the main initiators of the process of European integration was also the man who designed the genocide plan of the Peoples of Europe. It is a dark person, whose existence is unknown to the masses, but the elite consider him as the founder of the European Union. His name is Richard Coudenhove Kalergi. His father was an Austrian diplomat named Heinrich von Coudenhove-Kalergi (with connections to the Byzantine family of the Kallergis) and his mother the Japanese Mitsu Aoyama. Kalergi, thanks to his close contacts with all European aristocrats and politicians, due to the relationships of his nobleman-diplomat father, and by moving behind the scenes, away from the glare of publicity, he managed to attract the most important heads of state to his plan, making them supporters and collaborators for the "project of European integration". In 1922 he founded the "Pan-European" movement in Vienna, which aimed to create a New World Order, based on a federation of nations led by the United States. European integration would be the first step in creating a world government. Among the first supporters, including Czech politicians Tomáš Masaryk and Edvard Beneš and the banker Max Warburg, who invested the first 60,000 Marks. The Austrian Chancellor Ignaz Seipel and the next president of Austria, Karl Renner, took the responsibility for leading the "Pan-European" movement. Later, French politicians, such as Léon Bloum, Aristide Briand, Alcide De Gasperi, etc. will offer their help. With the rise of Fascism in Europe, the project was abandoned and the "Pan-European" movement was forced to dissolve, but after the Second World War, Kalergi, thanks to frantic and tireless activity and the support of Winston Churchill, the Jewish Masonic Lodge B'nai B'rith and major newspapers like the New York Times, the plan manages to be accepted by the United States Government. 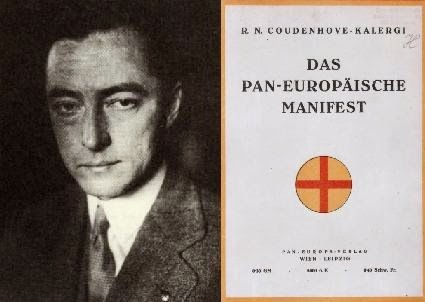 In his book «Praktischer Idealismus», Kalergi indicates that the residents of the future "United States of Europe" will not be the People of the Old Continent, but a kind of sub-humans, products of miscegenation. He clearly states that the peoples of Europe should interbreed with Asians and coloured races, thus creating a multinational flock with no quality and easily controlled by the ruling elite. Kalergi proclaims the abolition of the right of self-determination and then the elimination of nations with the use of ethnic separatist movements and mass migration. In order for Europe to be controlled by the elite, he wants to turn people into one homogeneous mixed breed of Blacks, Whites and Asians. The man of the future will be of mixed race. 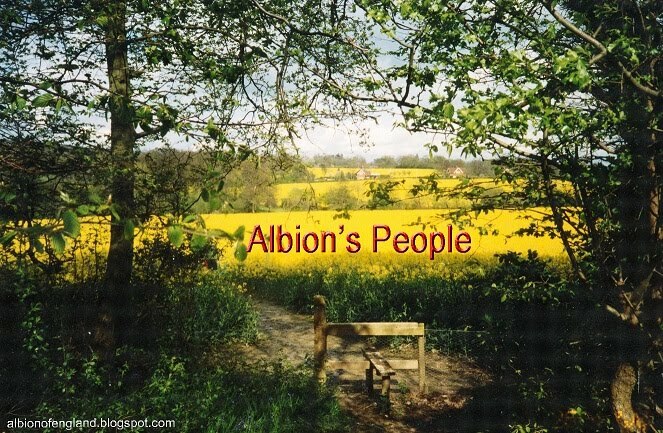 The races and classes of today will gradually disappear due to the elimination of space, time, and prejudice. The Eurasian-negroid race of the future, similar in appearance to the Ancient Egyptians, will replace the diversity of peoples and the diversity of individuals. Instead of destroying European Judaism, Europe, against her will, refined and educated this people, driving them to their future status as a leading nation through this artificial evolutionary process. 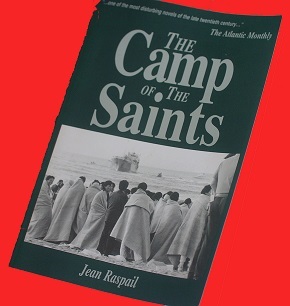 It's not surprising that the people that escaped from the Ghetto-Prison became the spiritual nobility of Europe. Thus, the compassionate care given by Europe created a new breed of aristocrats. This happened when the European feudal aristocracy crashed because of the emancipation of the Jews [due to the actions taken by the French Revolution]. Although no textbook mentions Kalergi, his ideas are the guiding principles of the European Union. The belief that the peoples of Europe should be mixed with Africans and Asians, to destroy our identity and create a single mestizo race, is the basis of all community policies that aim to protect minorities. Not for humanitarian reasons, but because of the directives issued by the ruthless Regime that machinates the greatest genocide in history. The Coudenhove-Kalergi European Prize is awarded every two years to Europeans who have excelled in promoting this criminal plan. 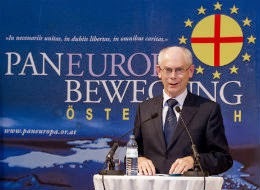 Among those awarded with such a prize are Angela Merkel and Herman Van Rompuy. The incitement to genocide is also the basis of the constant appeals of the United Nations that demands we accept millions of immigrants to help with the low birth rates of the EU. According to a report published on January 2000 in «Population division»Review of the United Nations in New York, under the title "Immigration replacement: A solution to declining and aging population," Europe will need by 2025 159,000,000 migrants, that is 159 MILLION migrants. One could wonder how there can be such accuracy on the estimates of immigration, although it was not a premeditated plan. It is certain that the low birth rate could easily be reversed with appropriate measures to support families. It is just as clear the contribution of foreign genes does not protect our genetic heritage, but enables its disappearance. The sole purpose of these measures is to completely distort our people, to turn them into a group of people without national, historical and cultural cohesion. In short, the policies of the Kalergi plan were and still are, the basis of official government policies aimed at genocide of the Peoples of Europe, through mass immigration. The servants of globalization are trying to convince us that to deny our identity, is a progressive and humanitarian act, that "racism" is wrong, because they want us all to be blind consumers. It is necessary, now more than ever, to counter the lies of the System, to awaken the revolutionary spirit of the Europeans. Everyone must see this truth, which European Integration amounts to genocide. We have no other option, the alternative is national suicide. We therefore observe a personality with strong snobbish attitudes, arrogance, and, allow me the term, "degenerate elitism." Also, the fact that his mother was Asian perhaps created internal conflicts and frustrations, something that can happen to people with such temperament. But the most decisive factor must have been the "proper teenager", which incidentally of course, was beside him, and became his first woman (at age 13): The Jewess Ida Roland, who would later become a famous actress. If this does not cause you concern it should. PS. I have no idea if the march of Islam into Europe and the UK has been factored in; it was not an issue when Coudenhove-Kalergi drew the blueprint for a New Europe. I have no doubt there is contingency plans if Islam threatens the continuity of the New Order for Europe.